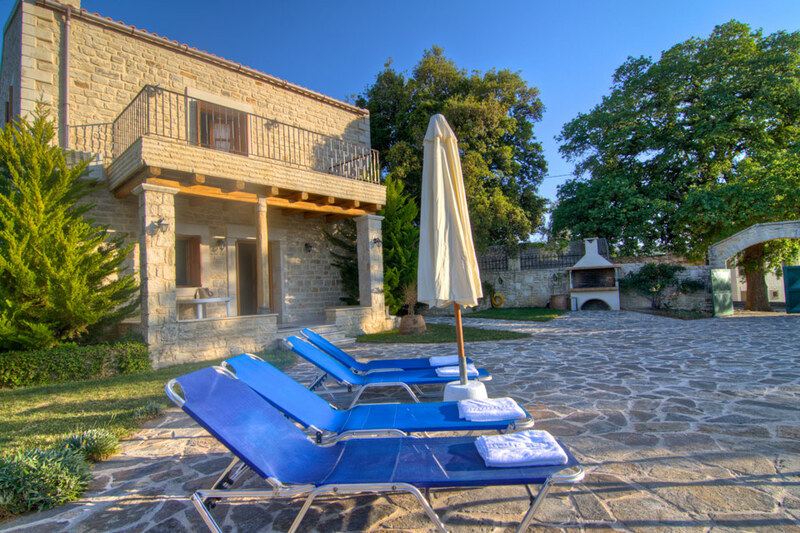 - The villa is located in an area with unique natural beauty and one very important archaeological site just a few meters away. 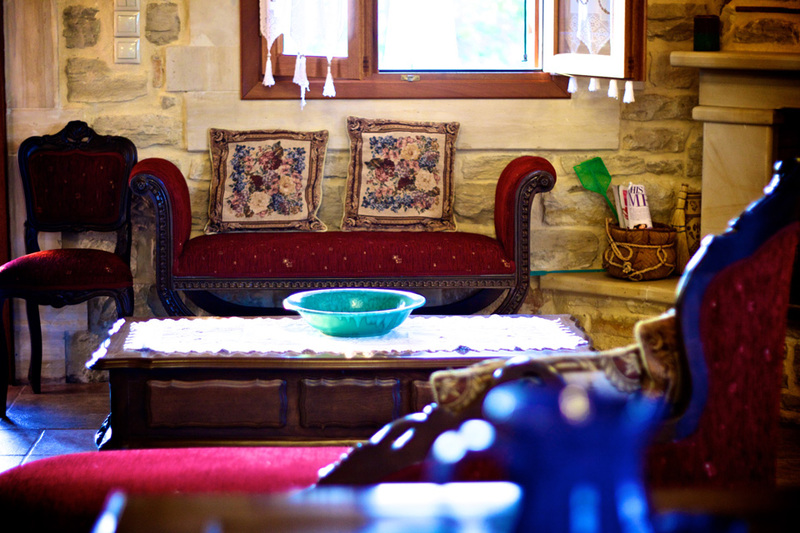 - The village is very quiet and offers relaxing holidays away from it all. 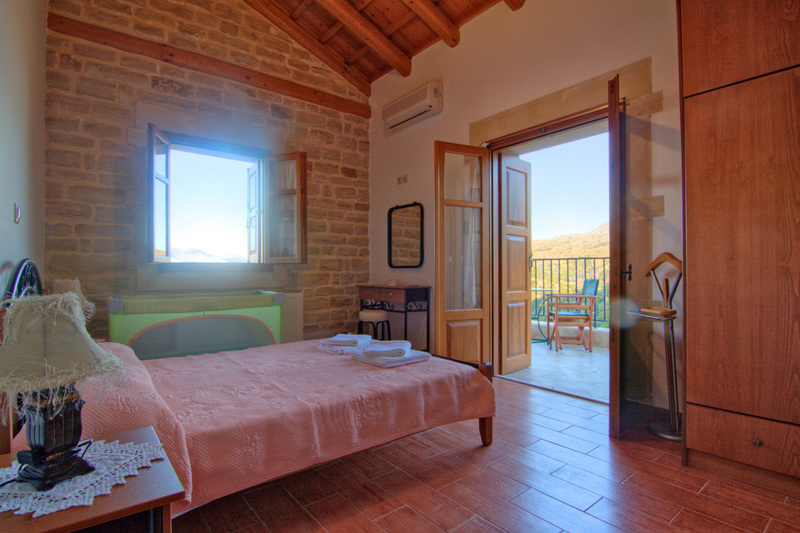 - It has privacy, spacious outdoor areas and great views till the sea. - The swimming pool is isolated in a higher level that offers safety for young children. - Finally you will love seating and relax under the tree shadow enjoying the view! 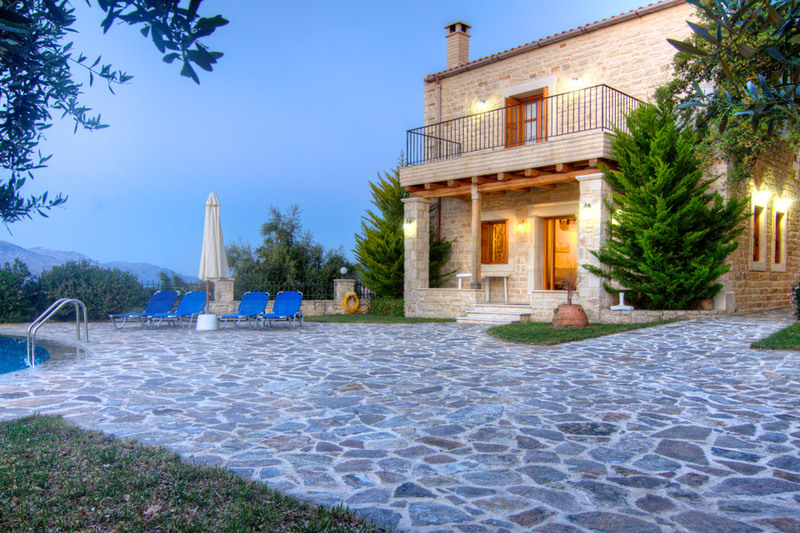 Villa Magda is approved by Greek Tourism Organization with license number: 1041K91002886601. Our enormous fenced garden is surrounded by numerous flowers and trees. 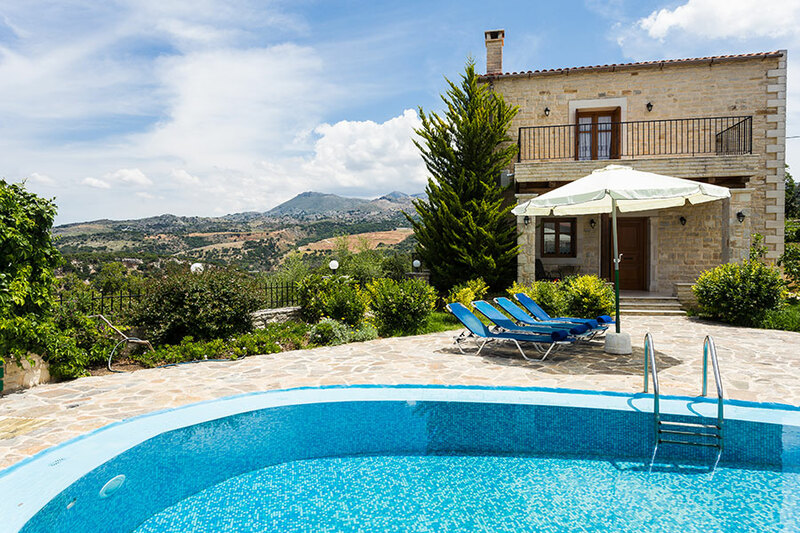 There are private pool, fully equipped barbecue and dining areas. 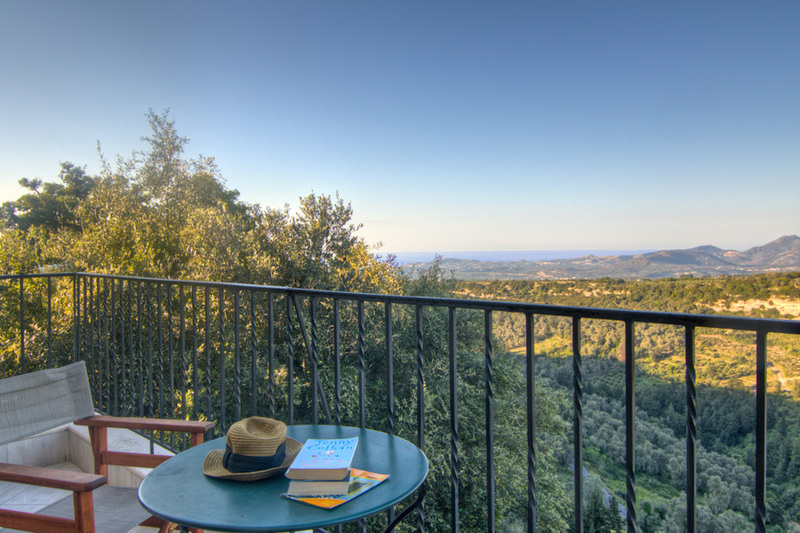 In addition you can enjoy the spectacular view of surrounding area from our garden. 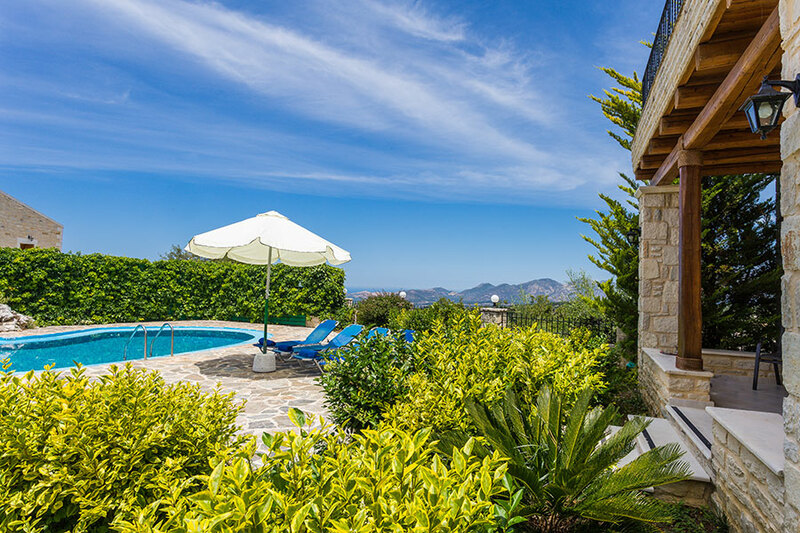 A 32 m² private swimming pool with a sunbathing area including sun beds, umbrellas and sitting areas. From the pool area you can also enjoy the panoramic view! The pool is isolated in a higher level that offers safety for young children. 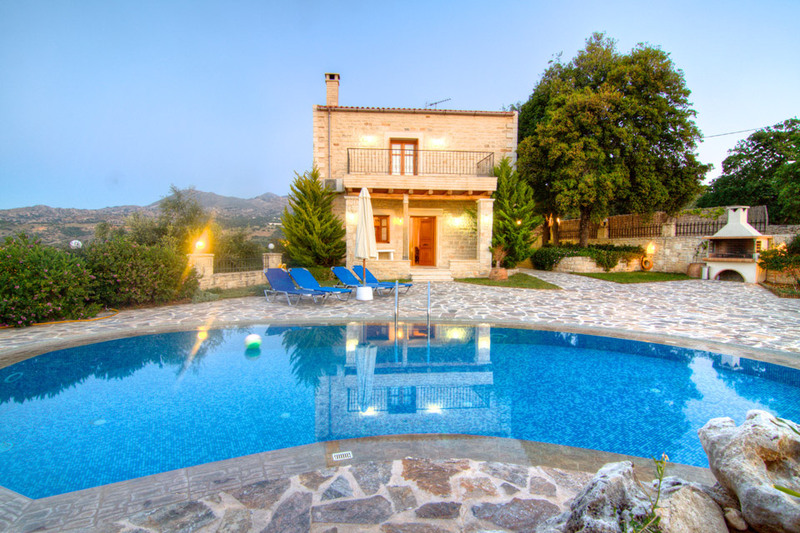 Minimum depth: 0.7 m, Maximum depth: 1.5 m.
The villa has 2 air-conditioned bedrooms, one in each floor. One bedroom has a double bed and the other one with 1 double bed and 1 single bed. We will provide you a baby cot if it is necessary. 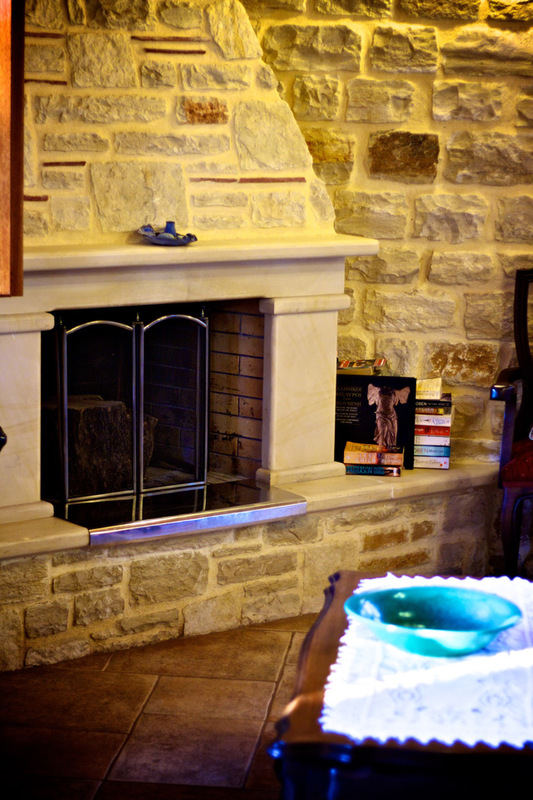 There is a spacious open plan living room area with satellite HDTV and fireplace on the ground floor. 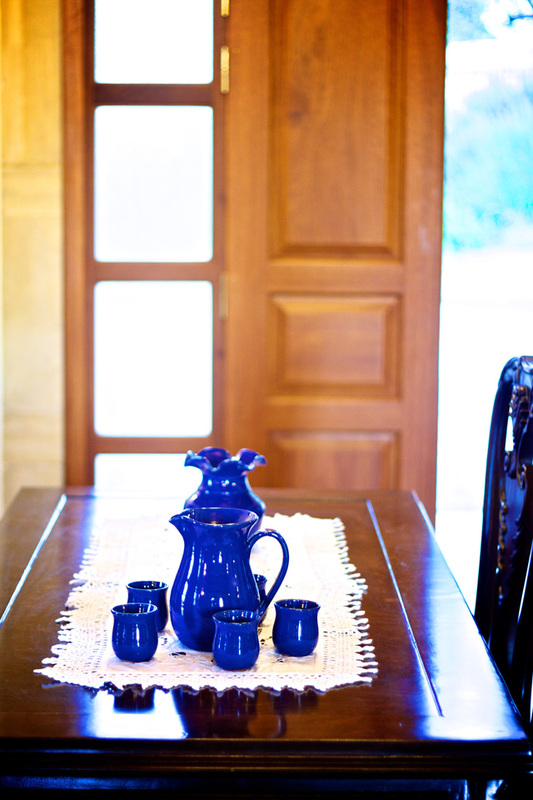 You will find the open plan fully equipped kitchen next to the dining area on the ground floor. It contains a large refrigerator, 4 ring stove and an oven, a microwave, dishwasher, a toaster and a filter coffee machine. 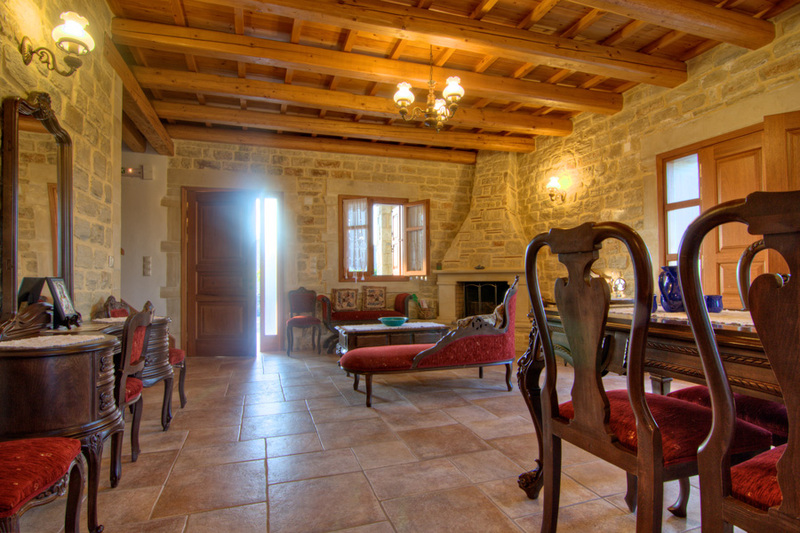 The villa has two dining areas, one indoor next to the kitchen area and the other in the barbecue area outdoors! 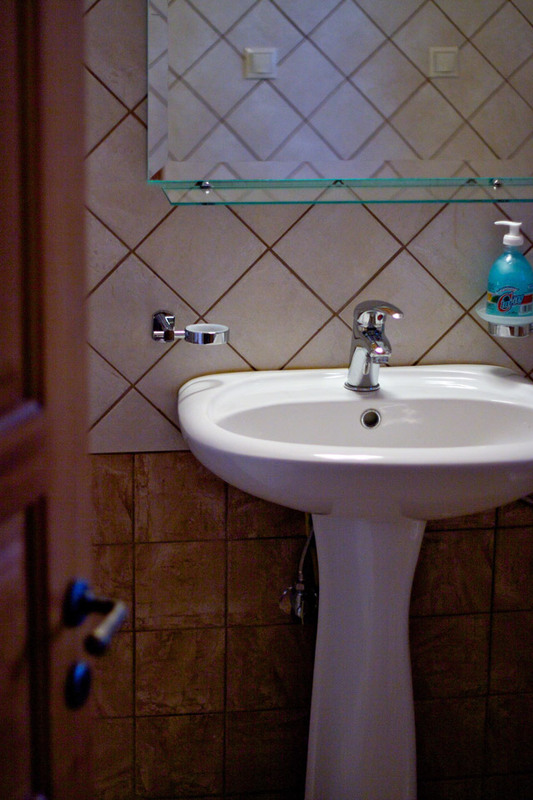 There are 2 bathrooms in the villa, one in each floor. 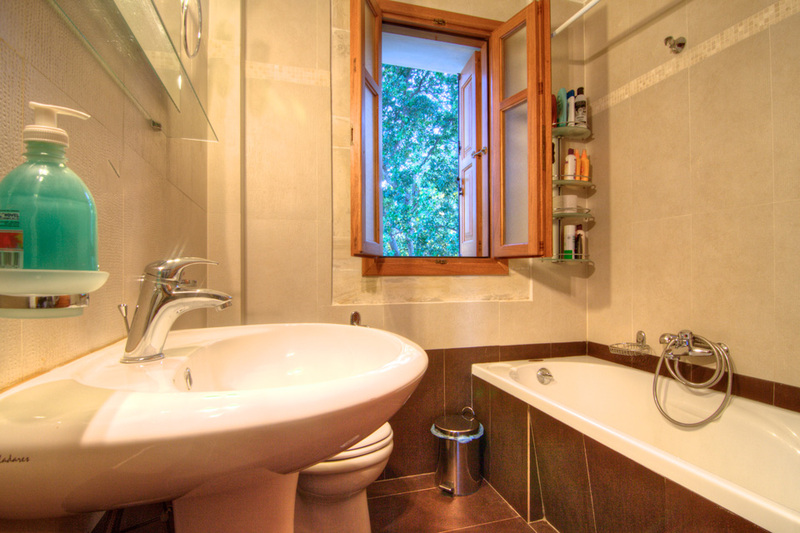 The bathroom on the ground floor has a shower and the one on the first floor has bath and shower. Fully equipped barbecue area is available in the garden area. We will provide you with everything that you might require such as charcoal. 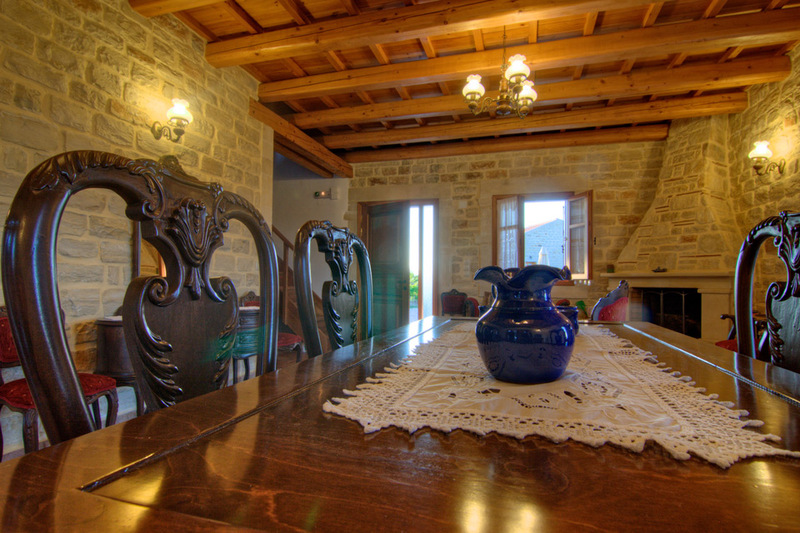 If you wish to visit Crete for your holidays, Magda and Stavros Villas are offering an ideal solution for family vacations and alternative tourism in a beautiful and peaceful family oriented natural environment. 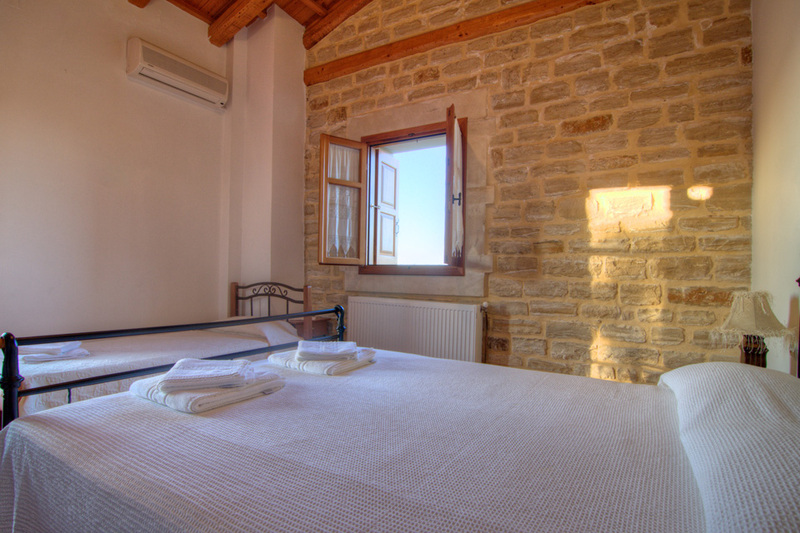 The villas are situated at the top of Ancient Eleftherna hill, in a region with over 4,500 years of historical interest. It is where the first astrophysical and first homeopathic doctor Diogenis Apolloniatis was born. 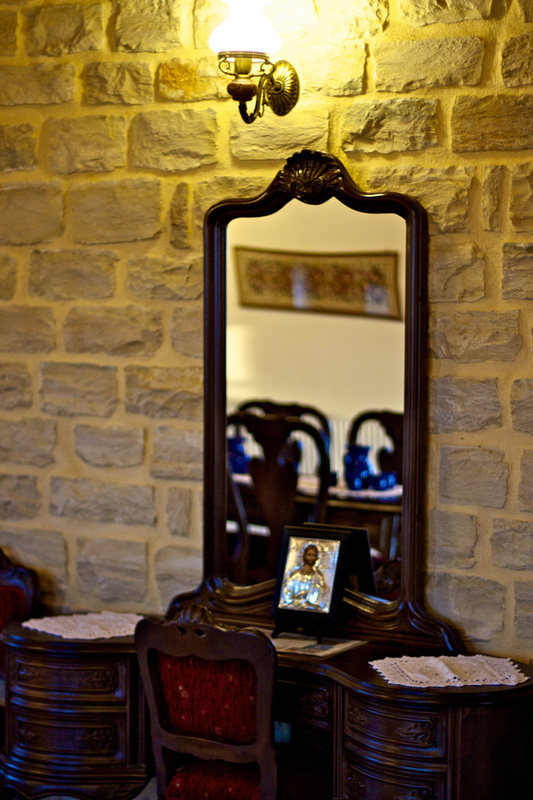 In a beautiful and relaxing environment with all modern amenities, you can enjoy traditional Cretan hospitality and our quality of service. 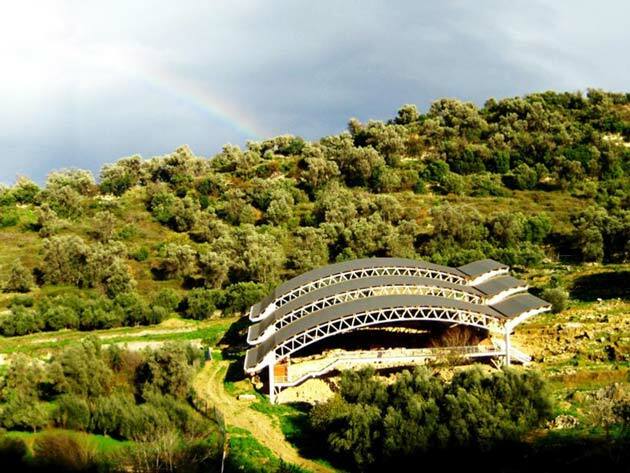 You can try local products such as olive oil, wine, tsikoudia and honey, visit historical sights and discover paths created forty-five centuries ago. 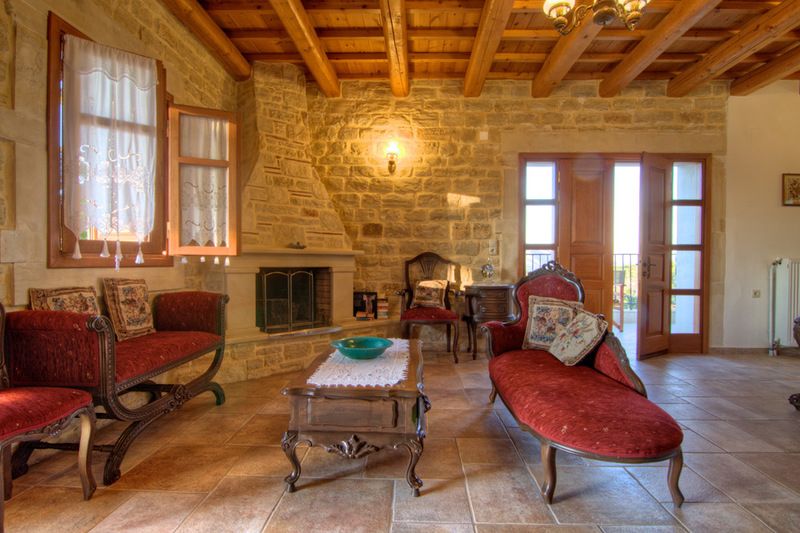 Villa Magda is a fully furnished house with traditional stone architecture, covering an area of 130 sq. m. The ground floor covers 72 sq. m. It can accommodate 5 people in beds. 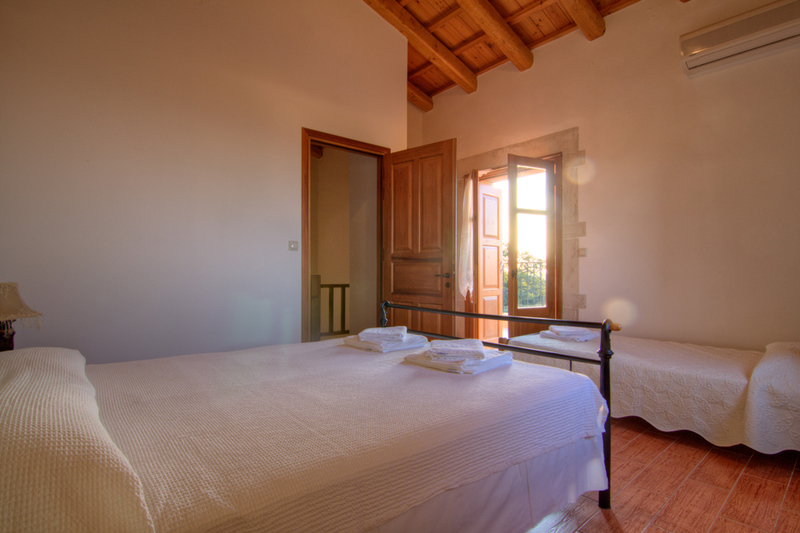 On the ground floor there is a spacious open plan living/dining room with fully equipped kitchen and a small balcony at the entrance, and a big terrace on the side with a magnificent mountain and sea view. 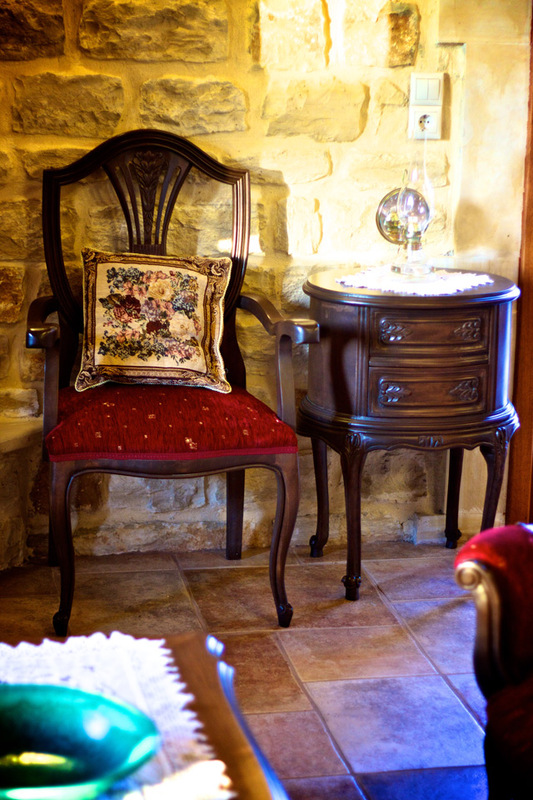 In the living room there is a sitting corner with sofas and fireplace and a big wooden dining table with TV corner. 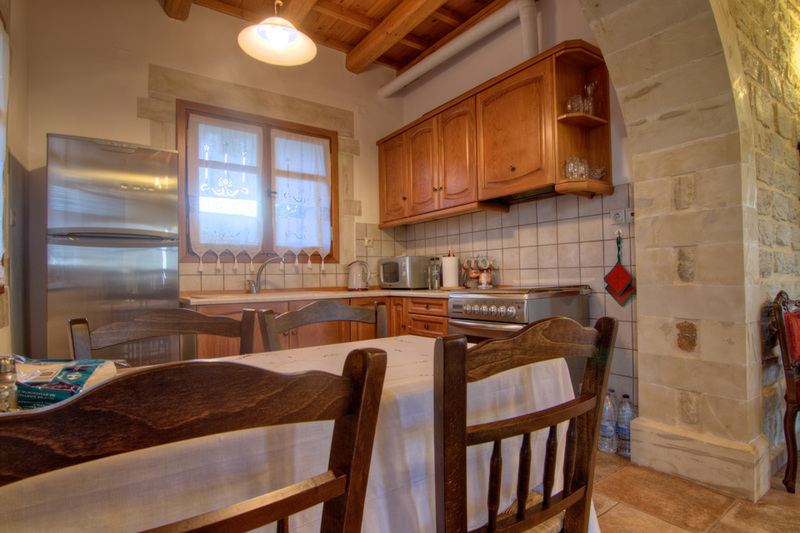 The kitchen is equipped with fridge/freezer, an electric stove with oven and a small help table.The villa has 2 air-conditioned bedrooms and 2 bathrooms, one each floor. 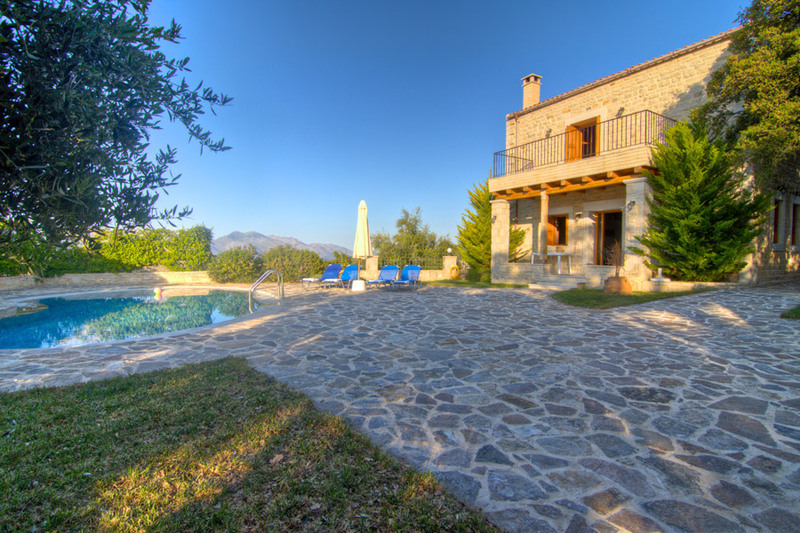 Outdoors of the villa there is a private swimming pool, charcoal barbecue and spacious lawn garden with amazing views. Press here to get directions from Villa Stavros to Rethymno City. Press here to get directions from Villa Stavros to Heraklion Airport. 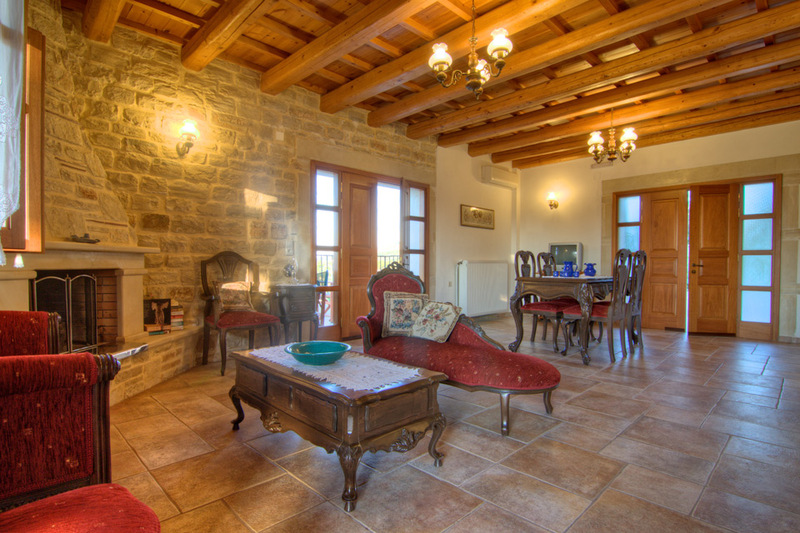 Press here to get directions from Villa Stavros to Chania Airport. 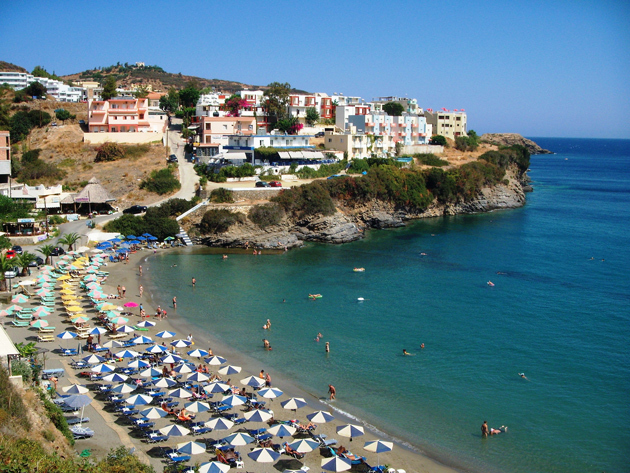 Traditional sea front village with sandy beach, taverns, restaurants, shops, cafeterias and bars. Press here to get directions from Villa Stavros to Panormo Village. 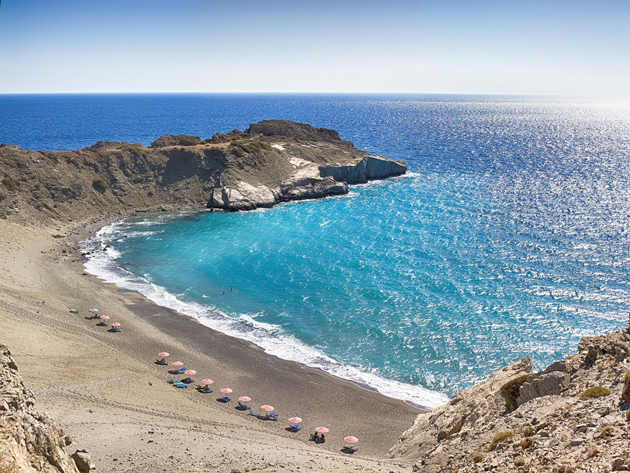 The closest beach to the villa is in Stavromenos area. 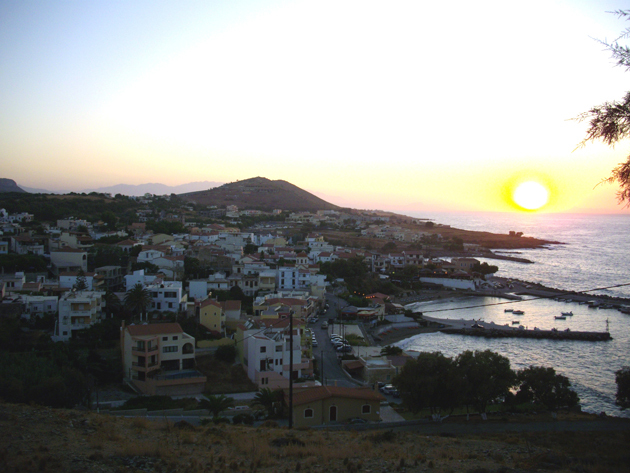 The beach of Panormos can be reached almost in the same distance as well. Press here to get directions from Villa Stavros to Stavromenos Village. Press here to get directions from Villa Stavros to Margarites Village. Press here to get directions from Villa Stavros to Eleftherna Village. Press here to get directions from Villa Stavros to Melidoni Village. 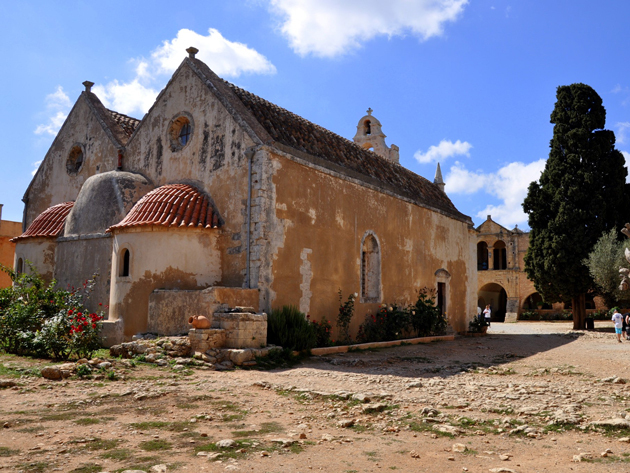 Press here to get directions from Villa Stavros to Arkadi Monastery. A town that you can find everything you might need such as shops, taverns and supermarkets. Press here to get directions from Villa Stavros to Perama Village. Press here to get directions from Villa Stavros to Anogeia Village. 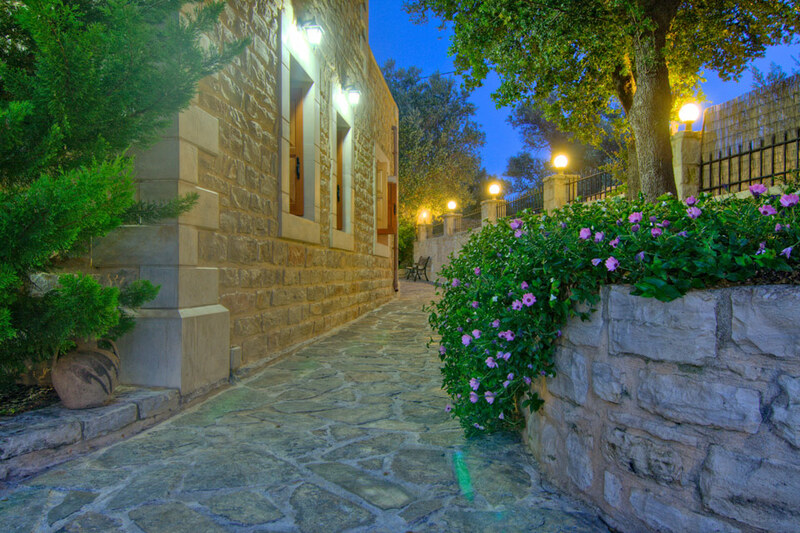 On of the most traditional villages in Crete. Press here to get directions from Villa Stavros to Zoniana Village. The closest traditional tavern is in the square of Ancient Eleftherna village, "Filio" Tavern. .
General hospital of Rethymno. There is also a health clinic in Perama village. Press here to get directions from Villa Stavros to Rethymno General Hospital. 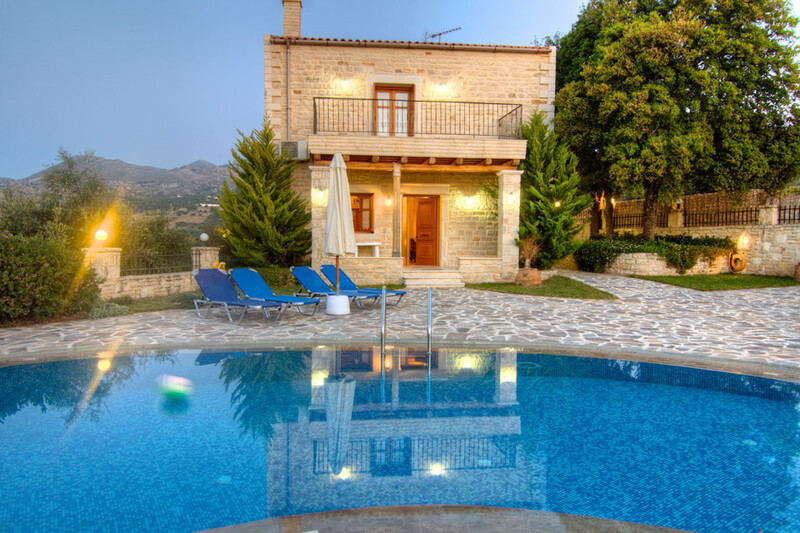 The villas are situated at the top of Ancient Eleftherna hill, in a region with over 4,500 years of historical interest. It is where the first astrophysical and first homeopathetic doctor Diogenis Apolloniatis was born. 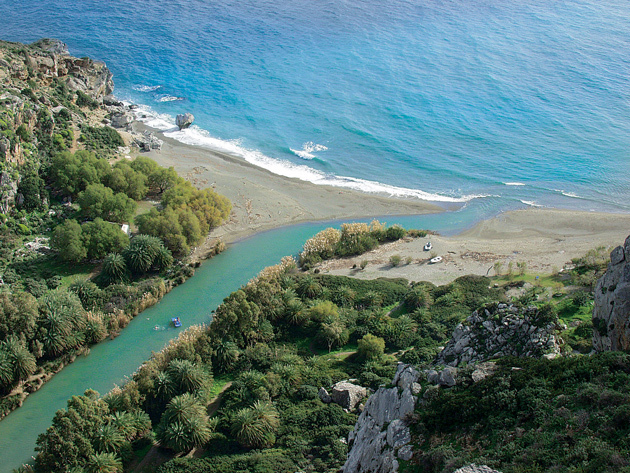 Ancient Eleftherna is located south-east of Rethymno. 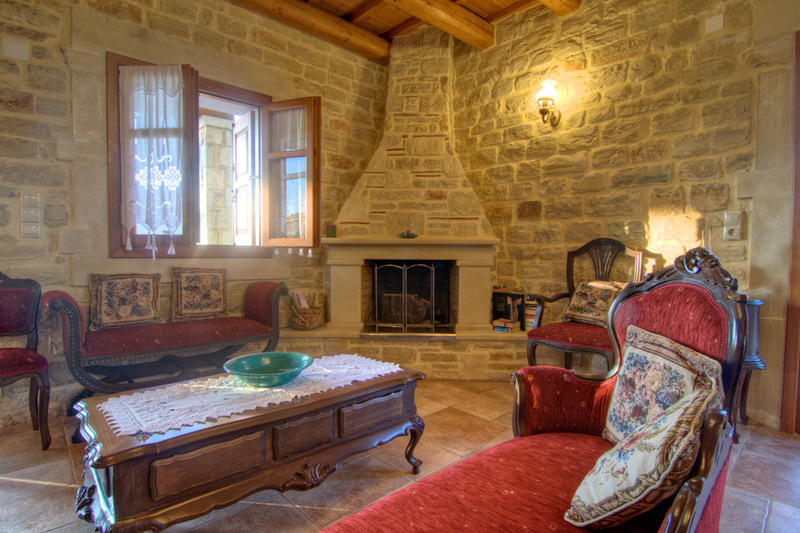 It occupies a wide area that mainly includes two ridges, called Pyrgi and Nissi. Three streams flow around the foot of the hills and join to the north of them. 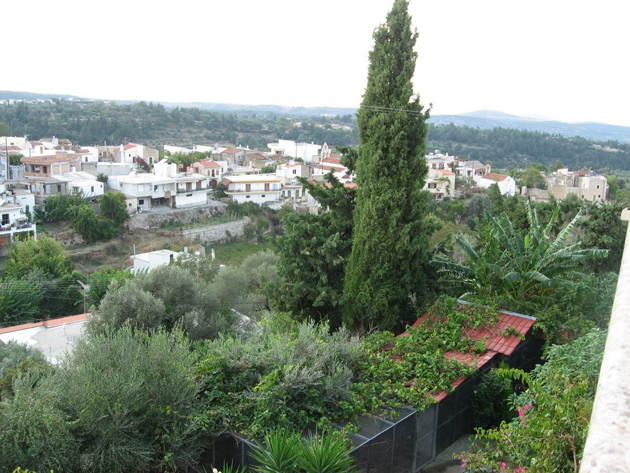 Eleftherna is since 30 years among the designated areas of 'outstanding natural beauty'. You can find a traditional tavern in Ancient Eleftherna village in 100 m away from the villa and shops and tavernas can be found in Eleftherna and nearby Magarites, while Rethymno with its sandy beach and waterfront restaurants is a half hour drive away. 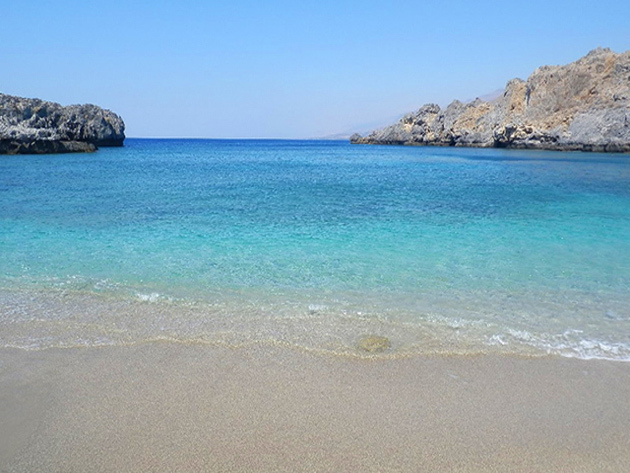 The closest beach to the villa is 15 minutes away by car in the area of Stavromenos. An other great beach 20 minutes away that you have to visit is the beach of Panormo. The village of Ancient Eleftherna or 'Archaia Eleftherna' (in Greek) is a quiet village where you will get the chance to interact with the very hospitable locals. The splendid combination of the green landscape view and the blue colour of the sky will free your soul and mind. 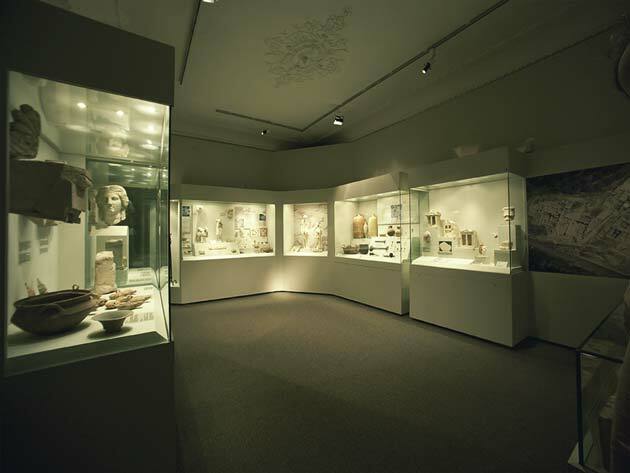 The Museum of Ancient Eleftherna is worth a visit for discovering and feeling the ancient history of the area. 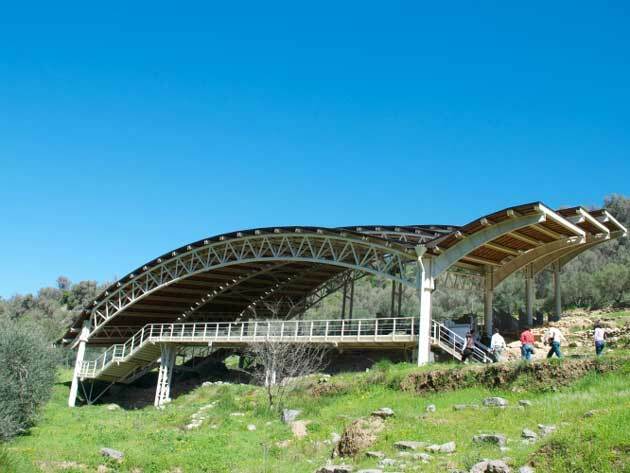 It is the first museum inside an archaeological site in Crete, as it is located next to the archaeological site of Eleftherna. 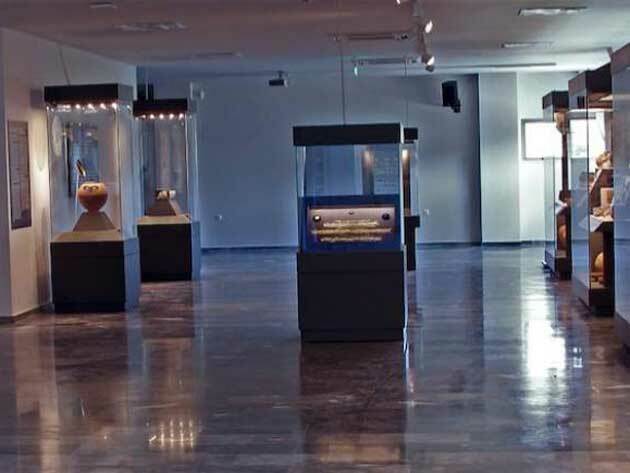 The three halls of the museum host the whole history of Eleftherna from 3000 BC to 1300 AD with everyday objects and artworks. 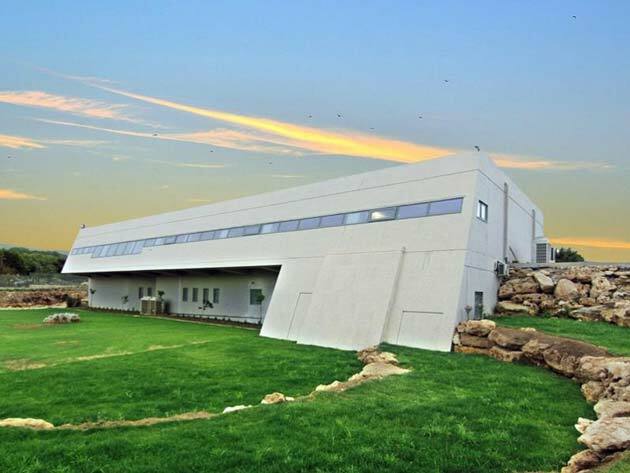 It is a modern building opened in 2016, approximately 1,800 sq.m. which together with the surrounding area occupies 3 acres and remotely resembles ark that emerges from the earth, gazing Ida (Psiloritis). 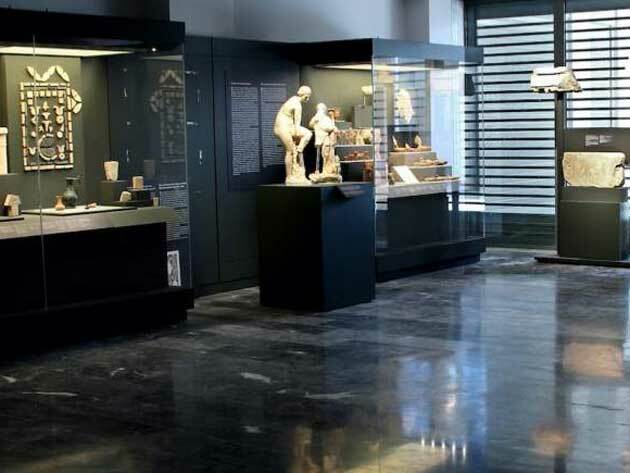 It is divided into two wings with the right one on the ground floor for hosting the guards - ticketing area and the Study Centre in the left area of ​​the exhibition halls of the museum. The architectural project was designed on a human scale, related to the natural environment, while at the same time as modern edifice is absolutely distinct and recognizable of the era in which it was created. 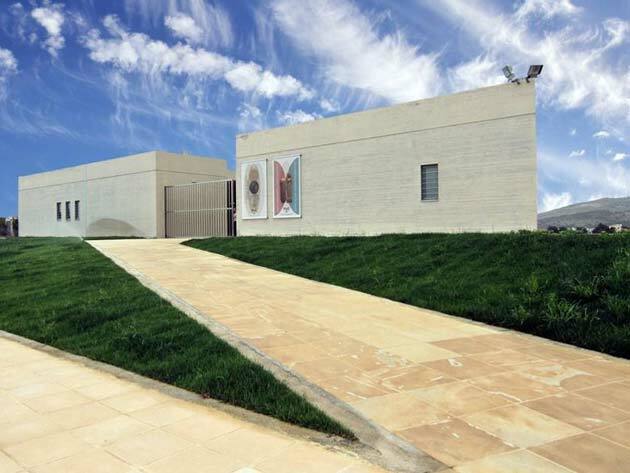 The large surrounding area in front of the museum features gardens and tree planting small parking for people with disabilities and especially paved surfaces with special provisions. 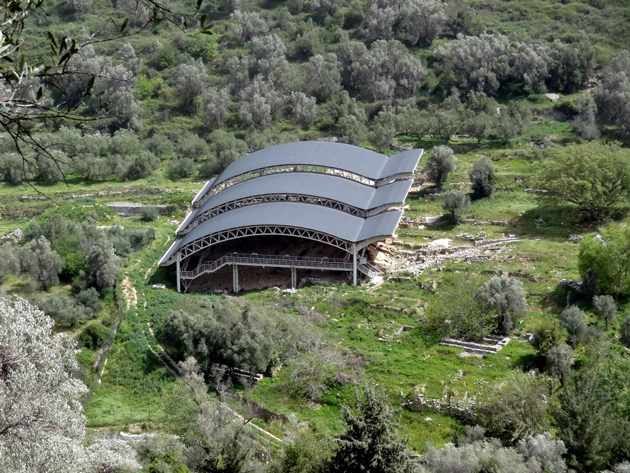 In large wide in space on the east side of the museum has formed a natural outdoor theater for the holding of events and for the enjoyment of nature. Everywhere there are trees, plants and herbs typical of the Cretan flora from antiquity to the present day which is also the perfect atmosphere to walk around. Eleftherna (Greek: Ελεύθερνα), also called Apollonia, was an ancient city-state in Crete, which lay 25 km southeast of Rethymno. 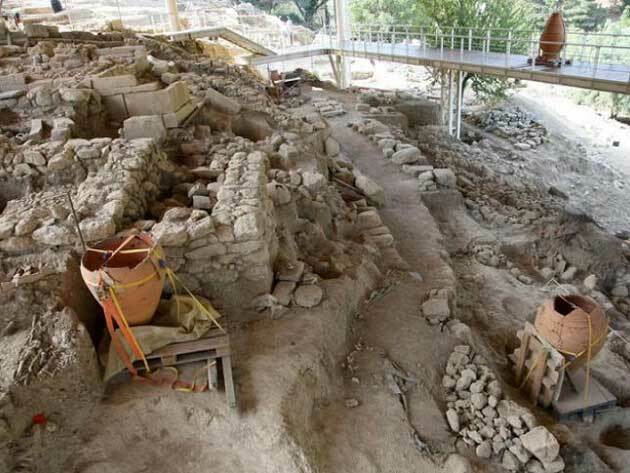 Archaeologists excavated the site, located on a narrow northern spur of Mount Ida, the highest mountain in Crete. 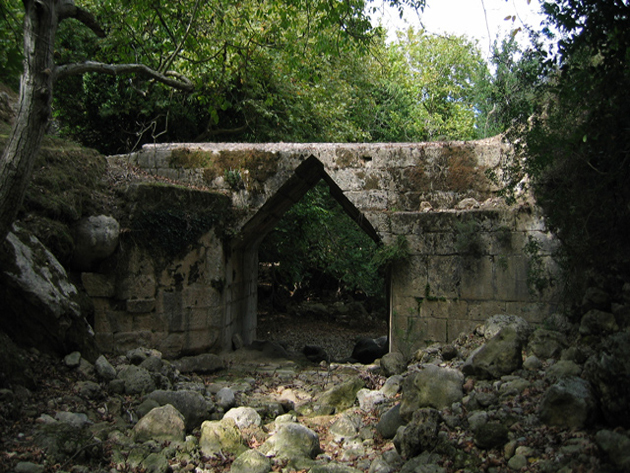 The site is about 1 km south of todays Eleftherna, in the current municipality of Rethymno. 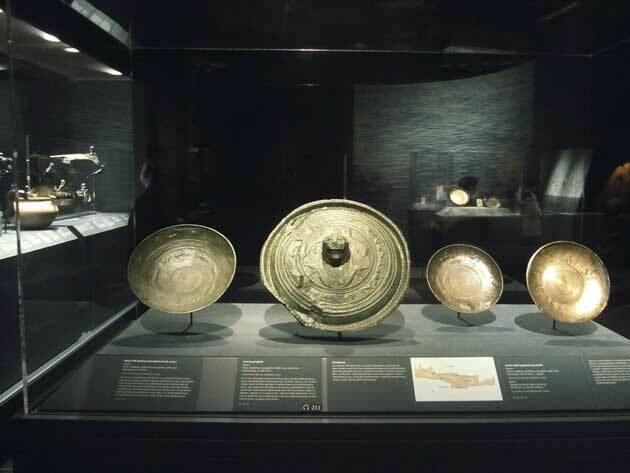 It flourished from the Dark Ages of Greece’s early history until Byzantine times. 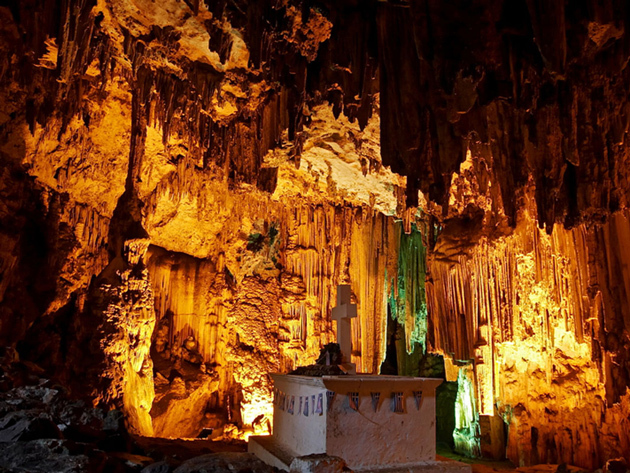 The city was founded by the Dorians in the 9th century BC. 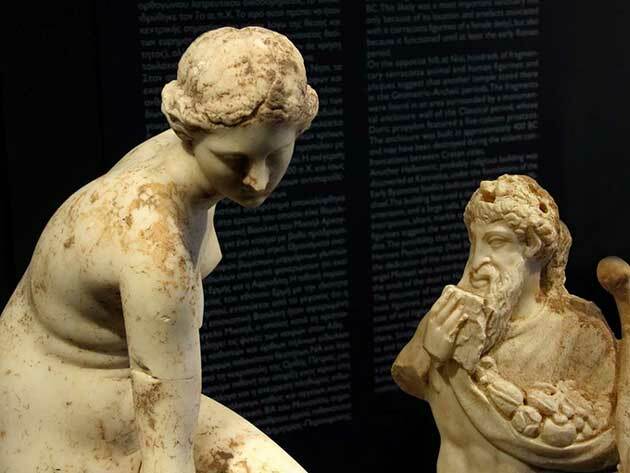 Current archaeological evidence shows that Eleftherna was one of Crete’s most important ancient cities, a capital city of the Geometric and Archaic periods – that is, the periods when the Homeric poems were disseminated and recorded in writing. According to tradition, the city was named after Eleutheras, one of the Kouretes, who protected the infant Zeus by beating upon their bronze shields thus preventing his father Cronus from hearing his cries and devouring him. 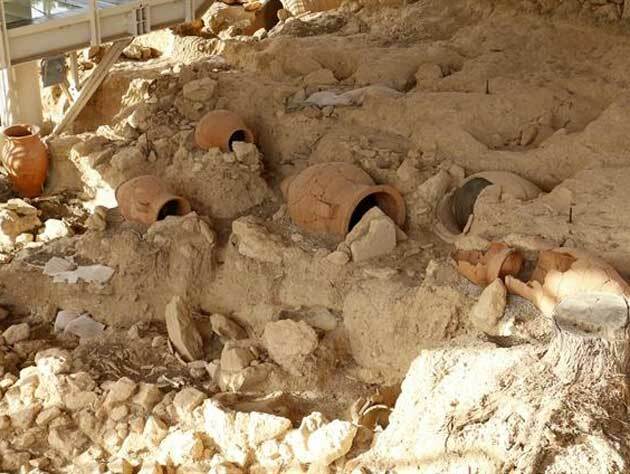 Since 1985 The University of Crete makes systematic excavations each summer and the findings so far are many and impressive. The discovery of a double tomb over 2,700 years old which hid more than 3,000 sheets of gold and the first depiction of the bee as a goddess is one of the most important excavations. 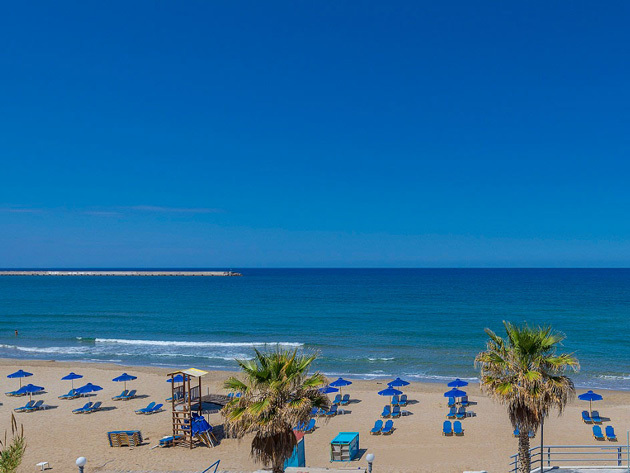 The closest beaches to the villa that we suggest you visit are: The part of long sandy beach of Rethymno in Stavromenos area is 16 km away from the villa. 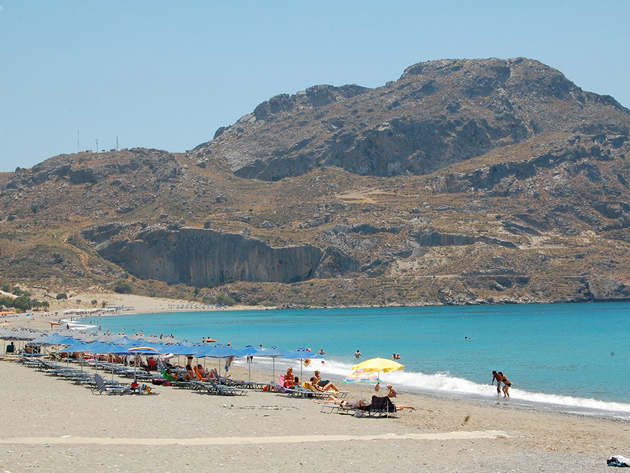 The sandy beach of Panormos is 17 km away. 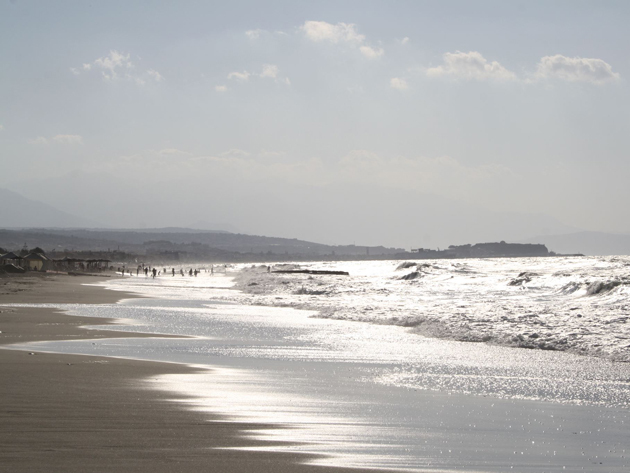 The beach of Bali which is 29 km away on your way to Heraklion. 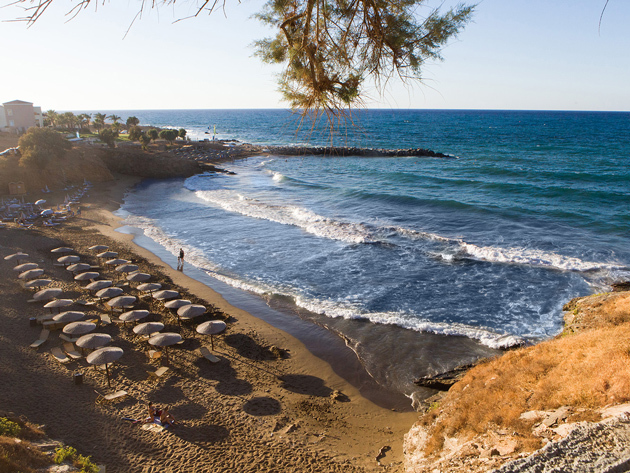 The long sandy organised beach of Rethymno with its numerous water sports is 27 km away. 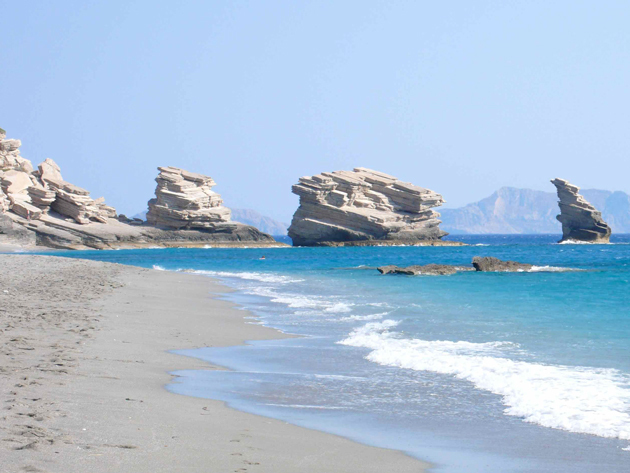 On the South coast of the island you can also discover some of Crete’s most amazing natural beaches such as “Schinaria”, “Damnoni”, “Triopetra”, “Agios Pavlos” and "Preveli". The distance to the South coast from the villa is about one hour by car and all the above beaches are located near to Plakias village where you can find shops and many taverns. 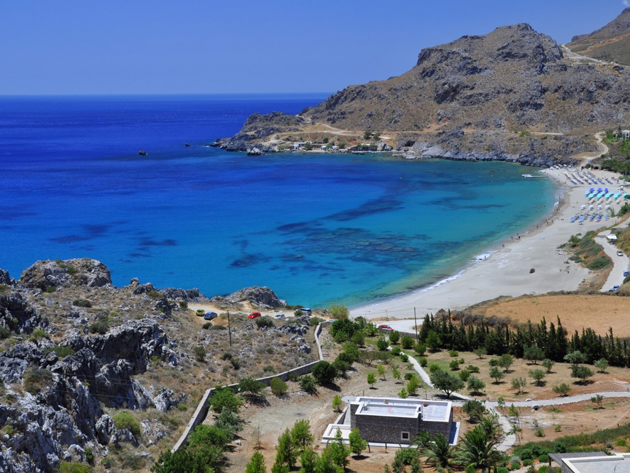 Crete is a magical island filled with myth and legend, a place to relax the ideal choice for all the family.